Quinns: Morning, everyone! Are you WELL? Is your soul a-thrum with jazz and song? If not, have another coffee, we’ll get you there. A wonderful article. Give them your traffic! 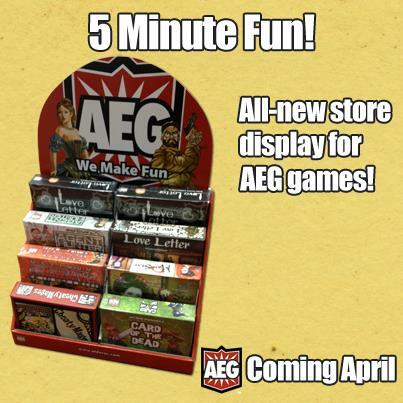 On the subject of elevating the hobby, AEG has announced some new… stands! For their smaller games! For shops! I’ll be honest, this seemed like a decent story when I was checking for news earlier, now I’m not sure what I was thinking. But you know what, I’ll stick to my guns. I like small games that you can carry around with you, accessible games that are tidy enough to be played in public. That’s good for the hobby. 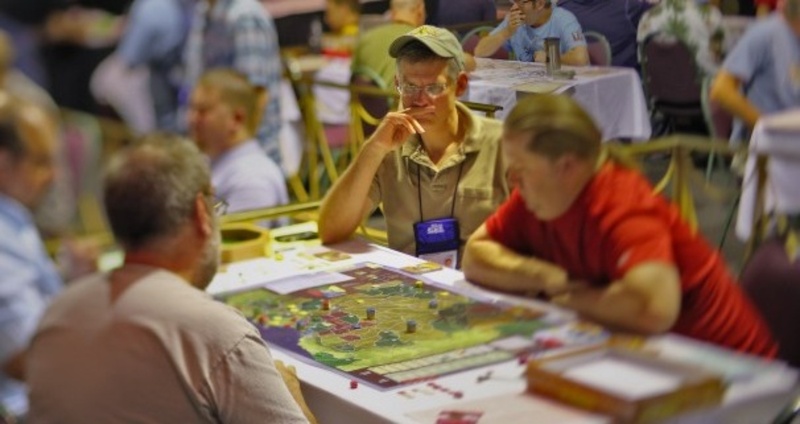 Therefore, better marketing of small games is also good for the hobby– oh God I’m not even convincing myself. New cardboard stand announced? It’s not exactly the bloody Hunger Games, is it. Let’s move on. This week has a Monday in it and features weather, which means Fantasy Flight has announced another expansion! 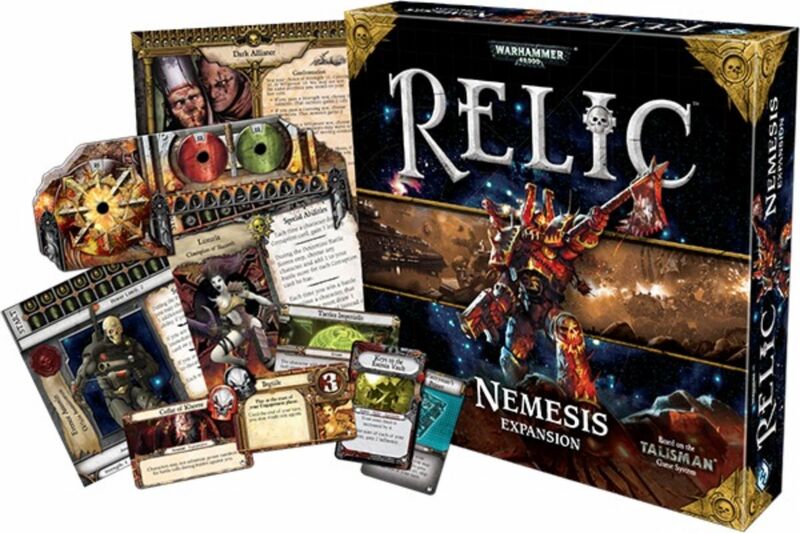 This time it’s Relic: Nemesis, an expansion for Warhammer 40k roll-n-move (n’ swear, n’ kill) game Relic, which we didn’t like very much. But that’s fine, because Relic isn’t for us. It’s for people who begin salivating at the words Genestealer and Land Raider. Relic: Nemesis does sound like a marked improvement, though, offering a variant where a lucky 50% of the players don’t simply orbit the board in an grimdark game of musical f**king chairs, but control bad guys, seeking to hinder and attack the others. I could get behind that. I love me a good team game. And of course, this being a Fantasy Flight expansion, it’ll bulk up all the original decks from the base game. 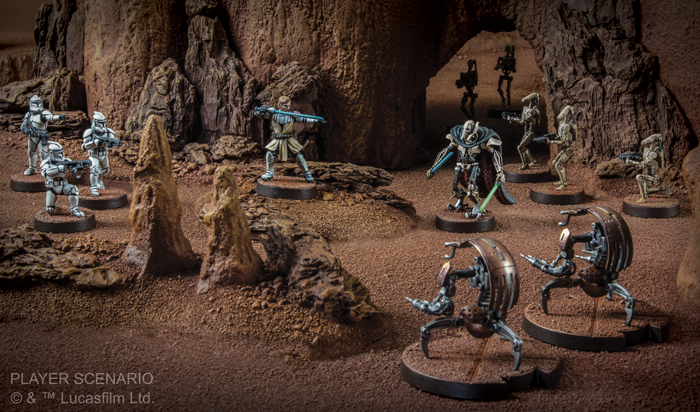 More scenarios, characters, threats, wargear, the works. I do love that. Bringing an expansion home and spending 15 minutes slipping it all into the base game, making it denser. Heavier. Like cardstock steroids. This is interesting. 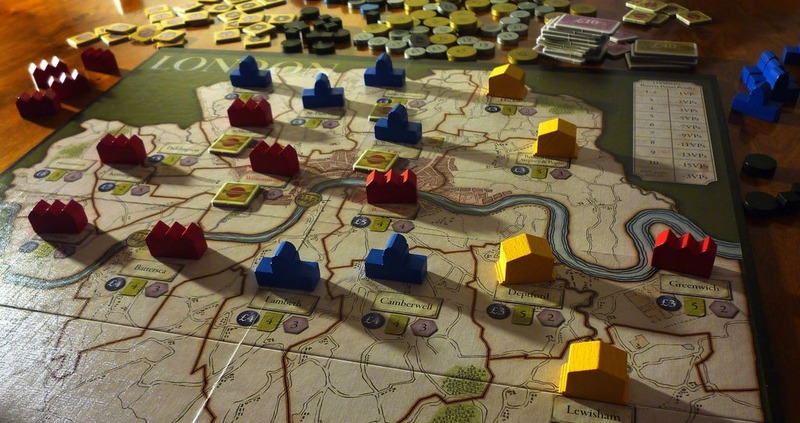 Martin Wallace, who will forever in my mind by the creator of the stellar A Few Acres of Snow, no matter how many more games he designs (such as London, pictured), has put a 2014 subscription offer up on the Treefrog Games site. Here’s how it works. You pay about £120 for a limited edition of three 2014 Martin Wallace games (featuring wood instead of cardboard), which we currently know almost nothing about, and each is mailed to your door throughout the year. Should you get involved? Way ahead of you! Here’s the Official SU&SD Verdict Of Each Game Based On Almost Nothing. We know this one’s a deck-building game, set in a fantasy world, where your deck affects the board, just like A Few Acres of Snow. THE VERDICT: Might be great. A game about ships, and the history of ships, and the money-making power of ships which baffles scientists to this day. Players will do a tax and a thing with trade. THE VERDICT: I don’t know. Mr. Wallace can’t announce this game yet, because he’s still in negotations about the sci-fi license behind it, though he’s 99% sure he’ll get said license. THE VERDICT: Don’t know, increasing to Must buy if the license in question is Johnny Mnemonic. No need to thank us for the service we provide, readers. Just doin’ my job. The Gold Club button is right over there, though. Speaking of how useful my job is, the following item should be of interest to all of you. 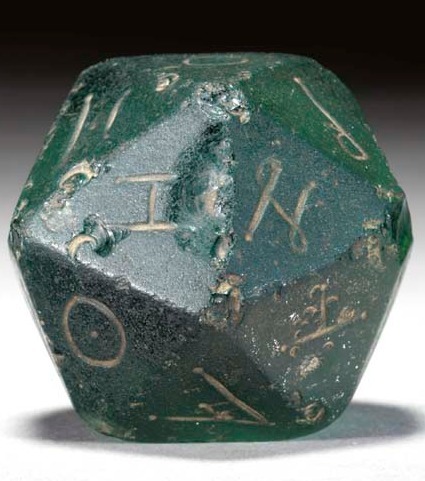 SU&SD fan Jason Stark has pointed me towards this Christie’s auction for a Roman 20-sided die, with a Price Realized of $17,925. Wait. Does that mean it’s already sold? Right, yes, this link is from 2003. Bad luck, everyone. Non-specific tabletop resource Team Covenant has begun shipping these tricked-out sets of Netrunner tokens, to go with the fancy acrylic tokens they sell for the Star Wars LCG and the X-Wing Miniatures Game. 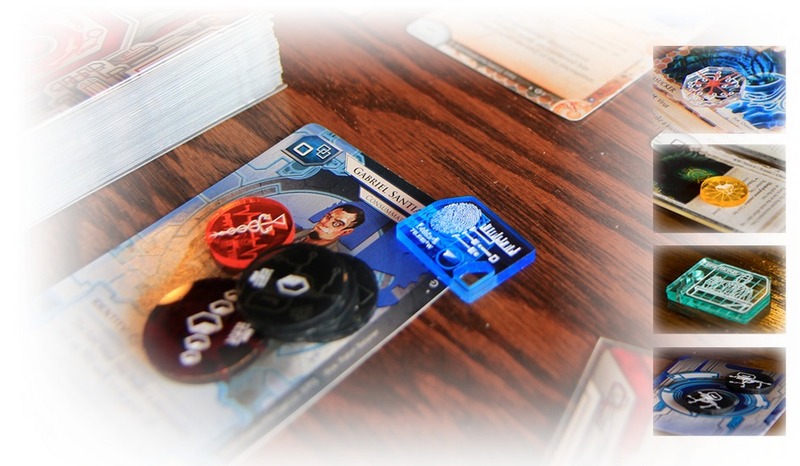 I know this, because they sent me some of the Netrunner ones, and I will review them right now! No need to thank me, no need. In short, they’re the nicest board game components I’ve ever touched. Turns out acrylic is the best thing. Who knew? I literally can’t stop touching the things, looking at them, and best of all, the poker chip-like NOISE they make when you drop them together! They almost come close to justifying the absurd price tag. $40 plus monstrous shipping for anybody outside the United States. 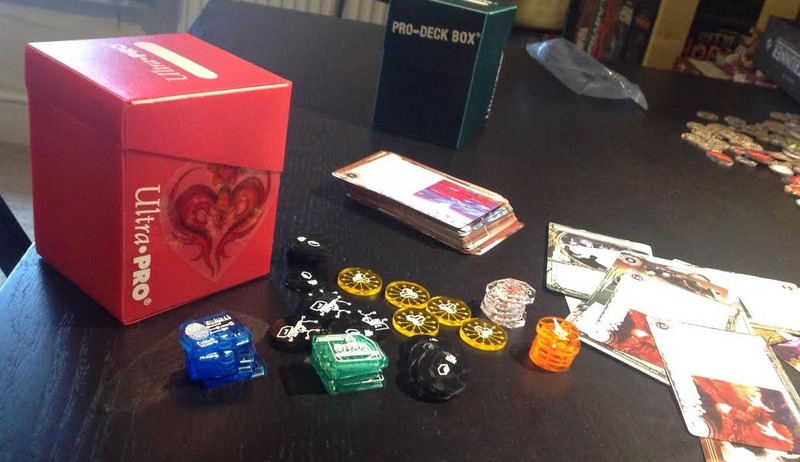 Leigh: You talking about those swanky candy-looking tokens you begged off Team Covenant? Leigh: I can’t wait til you bring these to our Netrunner group. Already your color-themed sleeves were drawing stares (“it’s a ICE STORM, so it’s WHITE”), and now you’re going to be plunking out these things all over the pub. We get it, Quinns, you are a very fancy Netrunner. Quinns: Alright. This didn’t occur to me when I was ogling these tokens a month ago, but they’re almost too fancy for their own good. Leigh: Oh look, Quinns brought his Fancy Tokens. Did you bring enough for everyone, Quinns? Oh no, there aren’t enough for everyone, since there are just 5 Virus counters, 5 tags. You’ll just have to pile them around yourself like an embarrassment of Jolly Ranchers, while we all dither with our beer-damp cardboard bits. Quinns: Right. So you have an unpleasant choice. Do you bring them to a meet and keep the precious tokens yourself, at which point you look like a jerk, or do you buy two packs of the things for a stunning $80, at which point everybody’s going to be looking at you funny. Leigh: Like you’re a jerk who spent $80 on tokens, you mean? Still, you really should get another. There aren’t even enough tags for me to bury you in when I play Midseason Replacements. I mean, $40 is about how many drinks you’ll need to buy when you bring these tokens and lose. Right? Quinns: See, you’re making fun of me and you want to play with them too in the same breath. Also, that’s BIG TALK from somebody who put the Team Covenant sticker on their deckbox UPSIDE-DOWN. Leigh: DON’T POST THAT I liked it that way it looked like a HEART okay?